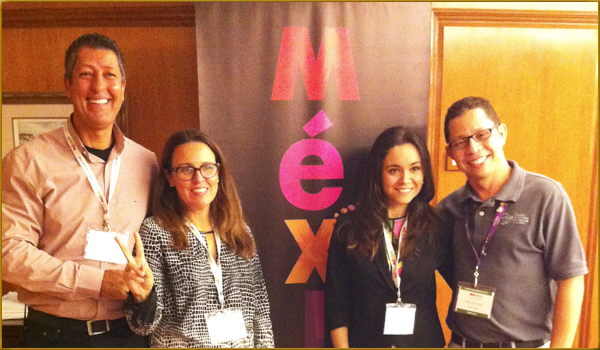 The Mexico Tourism Board trained 200 travel agents during their Brazilian tour in May; they also participated in the BNT MERCOSUL Tourism Business Exchange, which hosted over 700 business meetings. The promotion of the Riviera Nayarit and Puerto Vallarta in Brazil by the Riviera Nayarit Convention and Visitors Bureau (CVB) and the Puerto Vallarta Tourism Trust (Fidetur) intensified this past May. The entities were part of the Mexico Tourism Board’s official tour through four Brazilian cities; they rounded off their activities with a participation in the BNT MERCOSUL Tourism Business Exchange. A total of 200 travel agents were given the latest updates on the destinations during the MTB Tour through Brazil. The team worked its way from Rio de Janeiro and Belo Horizonte on May 11th and 12th, respectively, to Sao Paulo on the 18th and Campinas on the 19th. Representatives from the Riviera Nayarit and Puerto Vallarta attended all of the events. The activities consisted of a breakfast accompanied by a tradeshow, followed by a presentation by the MTB, the destinations and the airlines. The 21st edition of the BNT MERCOSUL Tourism Business Exchange was held from May 22-23 in Itajaí in the Brazilian state of Santa Catarina. Nearly 7,000 tourism professionals from six different South American nations attended the two-day event, along with 483 brands distributed among 131 booths. The organizers reported that each stand hosted an average of 360 business meetings, which means over 47 thousand of these meetings took place between vendors and buyers. A little over 700 of these were held with the Riviera Nayarit and Puerto Vallarta. There were 42 travel agent groups from 297 cities and 20 Brazilian states present at the exchange. Another 160 tour operator representatives and 227 journalists were also at the event. This fair is now in its 21st year of providing a platform for the exchange of commercial contacts and the promotion of destinations, thereby stimulating tourism in South America.